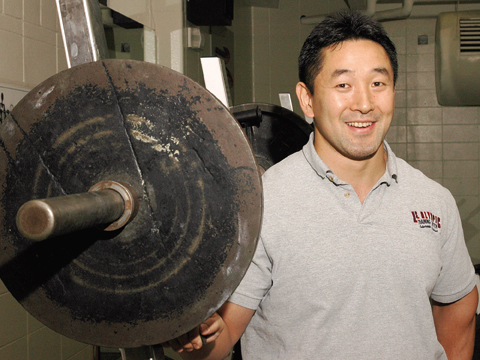 Shinya Takahashi, coordinator for strength and conditioning at UNL Campus Recreation, stands next to a set of free weights. A native of Ageno, Japan, Takahashi was drawn to Nebraska after watching the Huskers defeat Kansas State in Tokyo on Dec. 5, 1992. The game was Takahashi's first live encounter with American football. He earned his bachelor's and master's from UNO and has been with Campus Recreation for more than five years. Photo by Tom Slocum/University Communications. An initial taste of Husker football left a career-shaping impression on Shinya Takahashi. One of Nebraska's premier research centers has received a second multi-million dollar grant from the National Institutes of Health. The Nebraska Center for Virology has received $10.6 million, which will support the center over the next five years. Walking across the sun-soaked UCLA campus for the first time in 1964, Oyekan Owomoyela longed for his homeland of Nigeria. A steady stream of faculty, staff and students took advantage of the final public viewing of the UNL Campus Master Physical Plan during open houses Sept. 28 and 29 at the Nebraska and East unions, respectively. Faculty, staff and students are being offered a final opportunity to provide feedback on the proposed UNL Master Physical Plan. Safety concerns related to a UNL construction project will result in a temporary electrical outage on the weekend of Oct. 15. A new mobile lab gives UNL Extension the ability to diagnose crop diseases on-site. The link between advising and student success seems obvious, but often lies off academe's radar screen. That was the message offered by Charlie Nutt, associate director of the National Academic Advising Association. UNL alumnus Warren Buffett (left) talks with Microsoft Corp. founder Bill Gates outside the Lied Center for Performing Arts on Sept. 30. Buffett, the CEO of Berkshire Hathaway, and Gates opened their afternoon visit at UNL with a 90-minute, unscripted question and answer forum with 92 students from the College of Business Administration (right). The billionaire-duo also visited with university officials and Gates outlined his vision of future technology to students, faculty and administration officials during a lecture at the Kauffman Center. Marjorie Perloff, a literary critic of modern poetry and president elect of the Modern Language Association of America, will deliver the Robert E. Knoll Lecture, "The Rise, Fall and Mutation of Avant-garde Movements: The Case of Language Poetry" at 7:30 p.m. Oct. 6 in Andrews Hall's Dudley Bailey Library (room 228). The Sheldon Memorial Art Gallery will host a drawing panel at 5:30 p.m. Oct. 11, in conjunction with the "April Gornik: Paintings and Drawings" exhibition on view until Oct. 23. The Friends of the University of Nebraska Press will sponsor a hurt book sale from 9 a.m. to 3 p.m. Oct. 15 at the Press warehouse. The warehouse is located on R Street between Eighth and Ninth streets in the Haymarket district. The Lied Center for Performing Arts has announced that the Sons of Maxwell, brothers Don and Dave Carroll, will perform at 7:30 p.m. Oct. 12 in the East Union Great Plains Room.